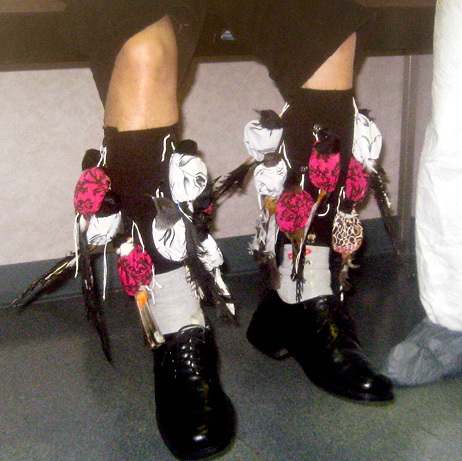 Dong wore an elaborate set of leggings with buttoned cloth wrappings, which held more than a dozen birds (pictured), the Associated Press reported. Inspectors had flagged Dong for inspection because he had abandoned a suitcase of 18 birds in the L.A. airport in December 2008. He had returned to Vietnam in February to collect more songbirds, which included red-whiskered bulbuls, magpie robins, and shama thrushes. The animals sell for up to U.S. 0 each in the United States, U.S. Attorney's Office spokesperson Thom Mrozek told the Associated Press. "They're rare and there are collectors who are willing to pay top dollar for these things," he said. The birds, now in quarantine, may be donated to a zoo. Dong, who was charged with conspiracy, is currently free as a bird on bail.